Why on earth anybody uses those pre-cut stick on letters from the hardware store is beyond us! 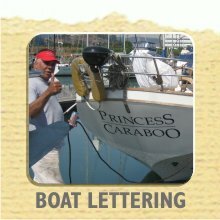 Painting the name on your boat is better, but, over time, the paint fades and you can see the actual brush strokes. High quality vinyl cut lettering is the way to go. Create your own design and email us the file, or have us design for you. Vinyl cut lettering is affordable and weathers well. With hundreds of colors and thousands of fonts available, There's no reason to use pre-cuts on your pride and joy. Contact Michael's Ink today and let us show you how.